Lundbeck and Otsuka announced that the Food and Drug Administration (FDA) has expanded the label of Abilify Maintena (aripiprazole) extended-release injectable suspension to include a new injection site, the deltoid muscle of the arm. The approval of the supplemental New Drug Application (sNDA) for a proposed new injection site was based on data from two open-label studies in stable patients aged 18–64 with a current diagnosis of schizophrenia. One study was a randomized, single-dose, parallel-arm, relative bioavailability study comparing the pharmacokinetic parameters of Abilify Maintena 400mg after injection in the deltoid muscle of 17 patients vs. injection in the gluteal muscle of 18 patients. In the second study, patients were randomized to receive at least one dose of Abilify Maintena 400mg injection in the deltoid (n=71) or gluteal (n=67) muscle; subsequent doses were administered to all patients in the deltoid muscle. Of those who received at least one dose of Abilify Maintena, 97.1% had no dose adjustment and only four patients had a dose reduction to 300mg. 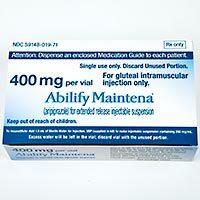 Abilify Maintena is an atypical antipsychotic indicated for the treatment of schizophrenia. When reconstituted with sterile water for injection, it forms an injectable suspension that can be administered monthly into the gluteal muscle or the deltoid muscle of the arm. Depot formulations enable concentrations of an active drug to remain at the therapeutic range for an extended period of time. For more information visit Otsuka.com or Lundbeck.com.